Following on from mild conditions in the Italian Alps, it was disappointing arriving in a mild, green Chateau D'Oex in the Pays d'Enhault region of Switzerland on the 16th January. The typical sub-zero temperatures and snowy landscape were nowhere to be seen. 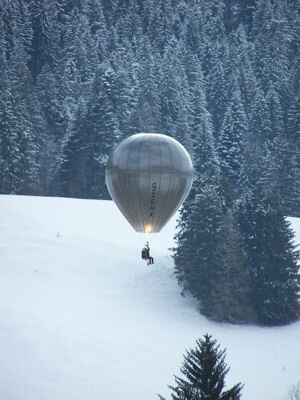 These conditions continued until the start of the Chateau D'Oex Balloon Festival on Saturday 20th January. The only snow to be seen was that trucked in for the balloon launch field. As the week went on, Tuesday evening saw a constant downpour of snow into the area magically transforming the town and mountains. Following the problems with the tiny AX-1 balloon in Italy where the deflation panel in the top of the balloon opened up shortly after taking flight, the balloon was shipped back to the manufacturers for repair. 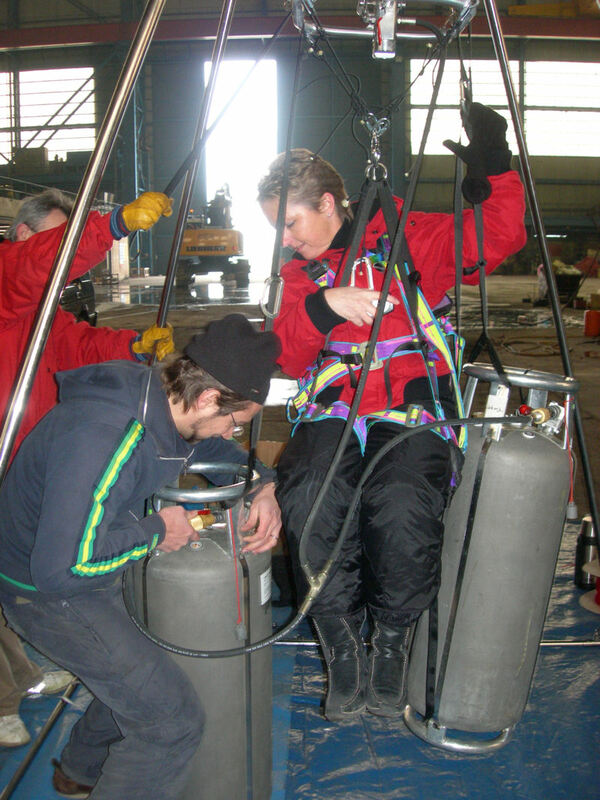 It was decided that the deflation panel in the balloon be sewn in. This would ensure a good seal but had the disadvantage of removing any capability to deflate the balloon quickly. 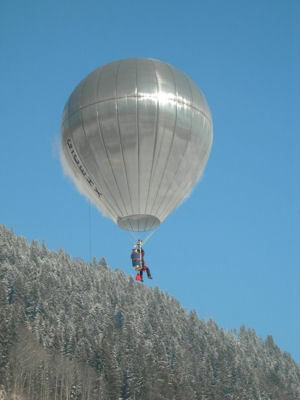 The only way to descend in this balloon was now by natural cooling. With the balloon fabric specifically designed to retain the internal heat, this constituted a potential problem landing in a tight space. 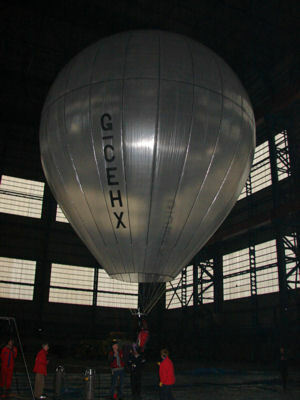 The photos above show the tiny AX-1 balloon being inflated in the huge Camell Laird shipbuilding sheds prior to shipping the equipment out to Italy and Switzerland. As you can see, the AX-1 envelope is transparent and made from a mylar composite material that is very light - the whole envelope weighing just 9kg. Pauline is seen being fitted with the harness and fuel cylinder connections to ensure that the assembly is comfortable for long duration flights. The forecast for the latter part of the week promised colder weather. With the repaired balloon envelope now back in Switzerland, it was decided to attempt the AX-1 records on Friday 26th January from Saanen Airfield, just outside Gstaad, 15km east of Chateau D'Oex. The surface temperature was -15 degrees C in the location that, due to the mountains to the immediate south, never sees sunshine and is consequently the coldest spot in the region. 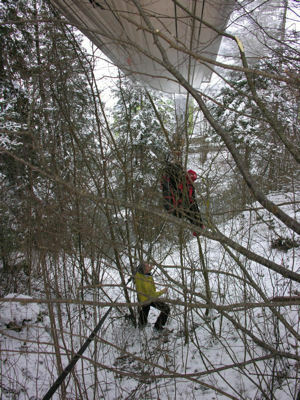 The balloon was prepared for flight and variable winds made this task tricky, with the balloon being moved around in all directions. Once all checks had been completed and the barograph and flight instruments packed, Pauline launched into the air with the intention of staying airborne for more than the existing record of 1 hour 11 minutes, hopefully breaking the distance record of 4.81km at the same time. The plan was to attempt the altitude record later in the flight once the fuel load had been reduced, minimising the stresses on the tiny balloon climbing to the necessary altitude. Within 10 minutes of being in the air, the balloon burner developed a fire engulfing the controls with Pauline sat above an electrified railway line. Fortunately, Pauline was wearing protective gloves and managed to carry out an emergency landing. The ground crew were on the scene in minutes. A decision was made to change the burner and seat system to a conventional system rather than to abort the flight completely. This added a significant weight penalty of around 15 to 20kg. 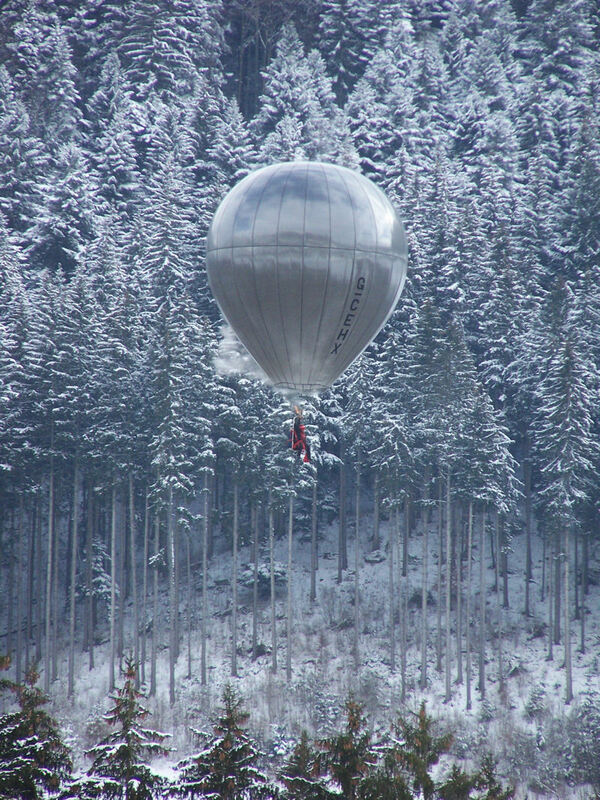 This weight surplus would clearly reduce the amount of duration that the balloon would fly for but, hopefully, still provide enough duration to beat the record. Pauline flew around the valley for 45 minutes before becoming stationary back above the airfield, keeping a watchful eye on the helicopter traffic that was operating from the field. Any close contact with helicopters would have caused severe turbulence and the end of the flight. 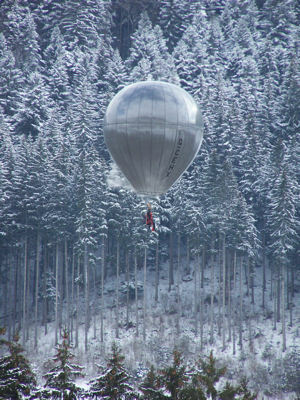 Pauline managed to stay airborne for 1 hour 40 minutes comfortably breaking the existing duration record, landing to the north of Saanen in an area heavily occupied by high voltage wires. The light winds in the area meant that the distance record was not broken on the day. 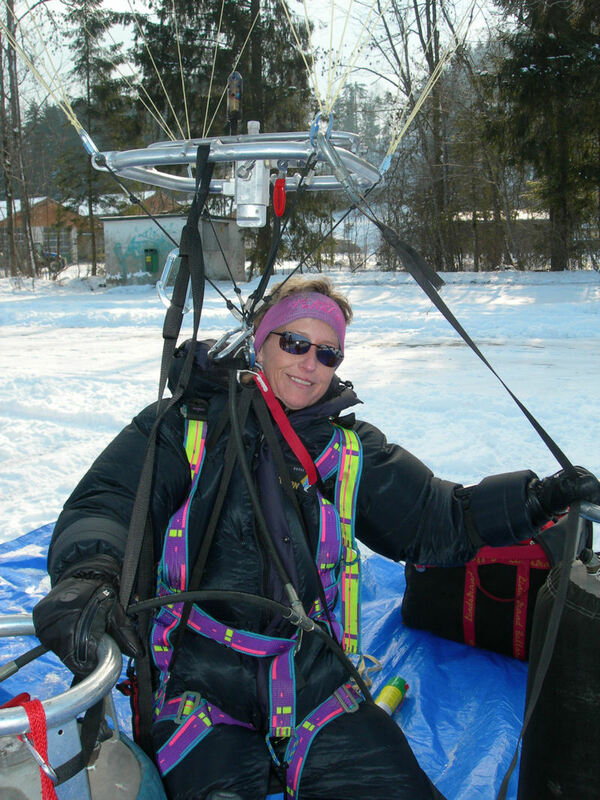 Pauline did manage to climb in the latter part of the flight to 458m, breaking the existing altitude record of 148m, set in 1978. The forecast for Saturday 27th January was for light winds along the valley so it was decided to attempt the distance record. 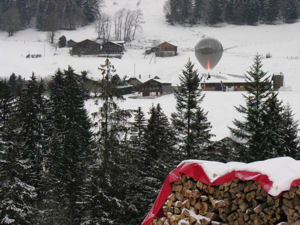 A launch site was chosen in Rougemont, 6km east of Chateau D'Oex. The visibility was not good at the launch site location with low cloud and falling snow but it was considered adequate enough to make the attempt. 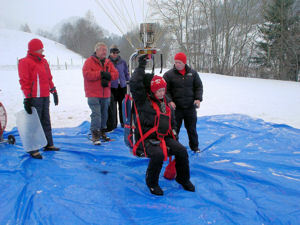 As Pauline took to the air, the snowfall increased but soon abated leaving the conditions better than at the time of launch. The winds were very light but they were in one specific direction, unlike the day before. Frantic calculations were made during the flight to check that Pauline had sufficient fuel onboard to beat the 4.81km of the existing record. The flight was fairly uneventful except that as Pauline approached Chateau D'Oex, a number of hazards presented themselves. Firstly, there are a lot of wires in the area. This includes both high voltage cables and cable-car wires. There were also large stretches of forested area in the valley reducing the amount of available land into which Pauline could make a landing. As Pauline approached Chateau D'Oex, with a dwindling fuel supply, the existing record of 4.81km was surpassed. 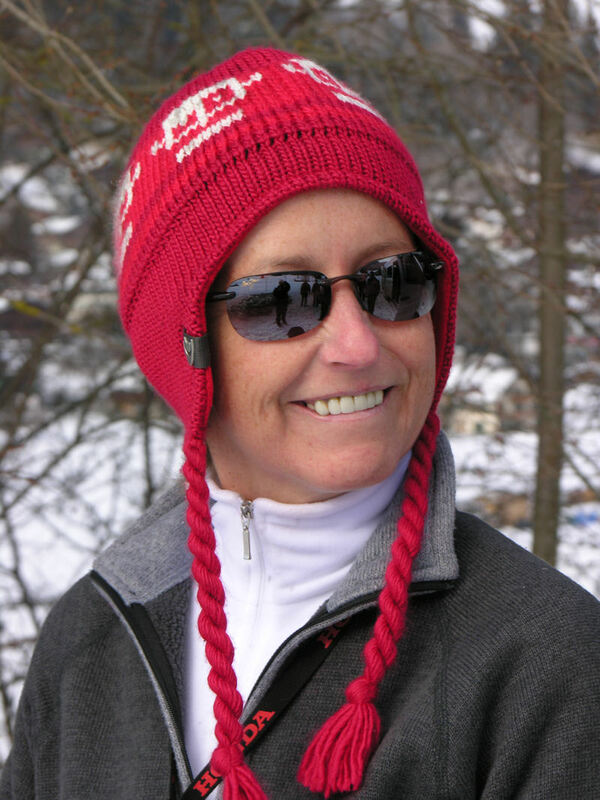 Pauline's progress was being closely watched by the thousands of visitors and participants at the Balloon Festival as she passed to the south of the field overhead the river and a line of trees on the river banks. 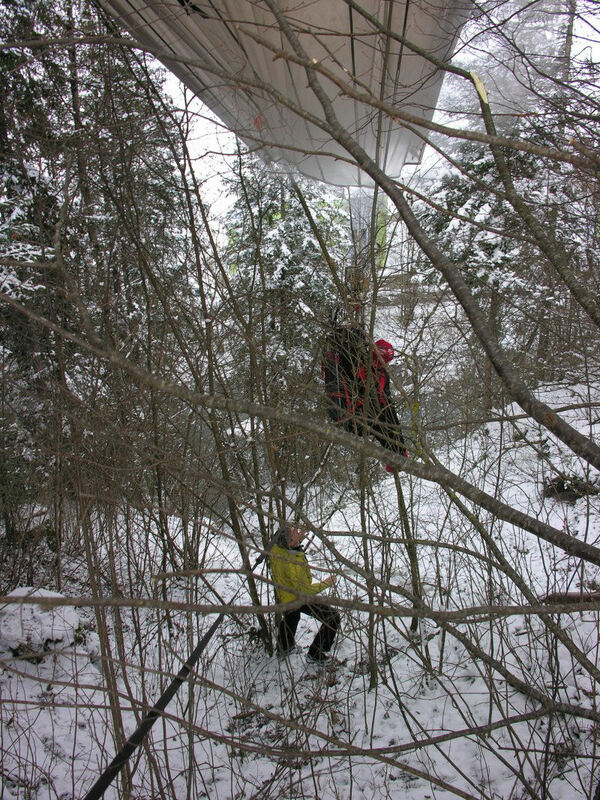 With fuel rapidly running out, and no opportunity to get the balloon into an open area, Pauline descended into the trees high above the river bank with her ground crew, frustratingly, 15 feet away unable to prevent the tree contact. Due to the steepness of the slope, it was necessary to absail down to Pauline. 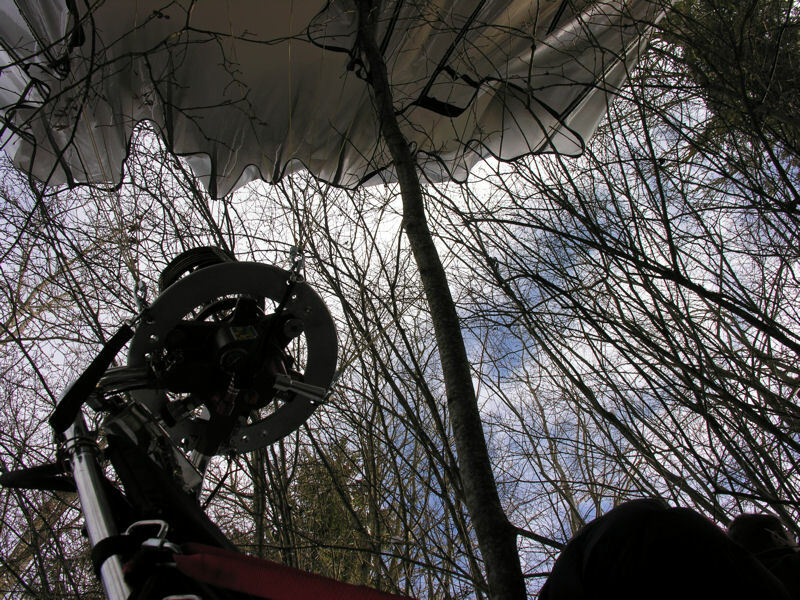 Once a few trees had been selectively manicured by chainsaw, the balloon and pilot were safely retrieved. The distance record had been broken with a distance of 6.59km. 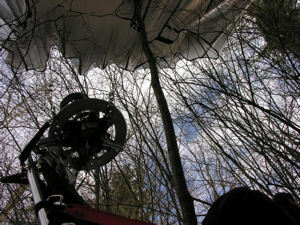 The pilot was unscathed and the balloon envelope suffered only minor, easily repairable, damage. The team would like to thank many people for their efforts, but in particular their sponsors for these records - Timmy and Ashley Donovan of Sean's Bar in Athlone, record holders themselves as the oldest pub in the UK and Ireland. Secondly, we would like to express our extreme gratitude to our three record observers - Donatella Ricci and Giovanni Piccinini in Italy and Patrick Kearley in Switzerland. Also due thanks are the National Aviation Authorities and National Aero Clubs of Italy and Switzerland and, in particular, the National Aero Club of Ireland for their support.